Tons of cat owners have Toxoplasma gondii, the common feline parasite. We've known for quite some time that T. gondii makes rats lose their fear of cats, making them more likely to be eaten. We've also known that the parasite causes humans to become more reckless, and in some cases hornier. 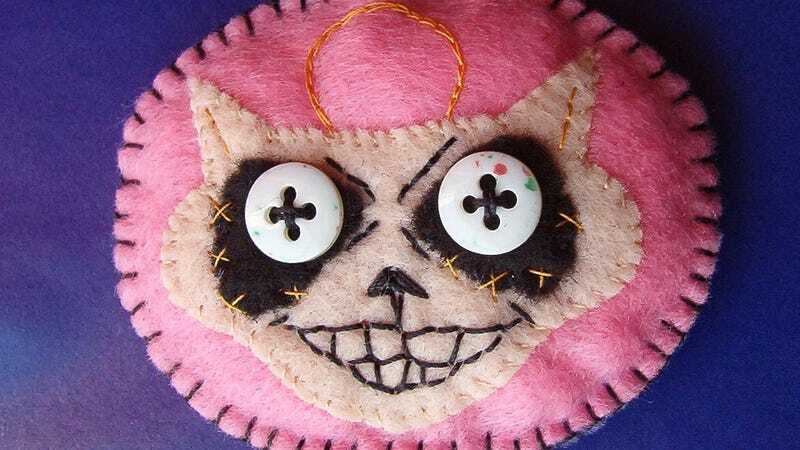 Top image: Creepy Cat #1 via Anima Handmade. But now, evidence is piling up that T. gondii may have something to do with the rise in schizophrenia, may be a major factor in hundreds of thousands of traffic fatalities, and could be driving people to suicide. There's new evidence that the parasite jacks up the dopamine receptors in your brain, which govern pleasure and fear responses, which could cause greater changes in behavior than we ever realized. All of which leads to the question: Just how much is this parasite controlling people's minds? No one would accuse Jaroslav Flegr of being a conformist. A self-described "sloppy dresser," the 63-year-old Czech scientist has the contemplative air of someone habitually lost in thought, and his still-youthful, square-jawed face is framed by frizzy red hair that encircles his head like a ring of fire. Certainly Flegr's thinking is jarringly unconventional. Starting in the early 1990s, he began to suspect that a single-celled parasite in the protozoan family was subtly manipulating his personality, causing him to behave in strange, often self-destructive ways. And if it was messing with his mind, he reasoned, it was probably doing the same to others. The parasite, which is excreted by cats in their feces, is called Toxoplasma gondii (T. gondii or Toxo for short) and is the microbe that causes toxoplasmosis-the reason pregnant women are told to avoid cats' litter boxes. Since the 1920s, doctors have recognized that a woman who becomes infected during pregnancy can transmit the disease to the fetus, in some cases resulting in severe brain damage or death. T. gondii is also a major threat to people with weakened immunity: in the early days of the AIDS epidemic, before good antiretroviral drugs were developed, it was to blame for the dementia that afflicted many patients at the disease's end stage. Healthy children and adults, however, usually experience nothing worse than brief flu-like symptoms before quickly fighting off the protozoan, which thereafter lies dormant inside brain cells-or at least that's the standard medical wisdom. But if Flegr is right, the "latent" parasite may be quietly tweaking the connections between our neurons, changing our response to frightening situations, our trust in others, how outgoing we are, and even our preference for certain scents. And that's not all. He also believes that the organism contributes to car crashes, suicides, and mental disorders such as schizophrenia. When you add up all the different ways it can harm us, says Flegr, "Toxoplasma might even kill as many people as malaria, or at least a million people a year."